Remember that Apple-Pear Butter I shared with you yesterday? Well, I had another ulterior motive for making it. This pie. I was flipping through Southern Living and spotted a recipe for an Apple Butter Pie. For days, it consumed a good portion of my thoughts. I knew I just had to make it. This pie is a little off the traditional fall pie path. Sure, it has plenty of fall flavors, but it’s a cold pie. I usually think of warm, toasty pie this time of year. But, this beauty changed my mind. First, there’s the gingersnap crust. 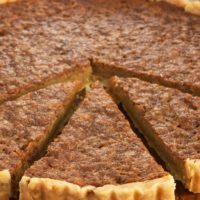 I’m not a huge fan of gingersnaps, but they are absolutely perfect for this pie crust. It’s one of those super simple two-ingredient crusts that you can make in just a few minutes. The filling couldn’t be simpler. We’re talking 4-ingredients-simple. 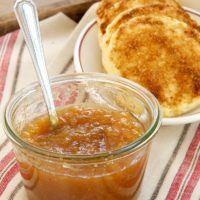 I used my homemade Apple-Pear Butter, but you can absolutely use store-bought apple butter. I decided to top off the pie with a layer of cinnamon whipped cream. You know that there’s never too much cinnamon in anything for me. If you want to dial it back, sweetened whipped cream will do. Then, just add some chopped gingersnaps top it all off. I truly could not like this pie more. It is delicious, simple, and gorgeous. What more could you want? 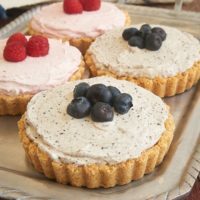 I’ve teamed up with some great bloggers and sponsors to bring Pie Week to you! With Thanksgiving around the corner, what better time to celebrate pie? Be sure to visit these sites and see the pies they’re baking this week. And, be sure to see my first #PieWeek post from earlier this week for even more pie inspiration. 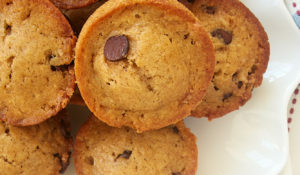 You’ll also find a couple of great giveaways from King Arthur Flour and Cabot. 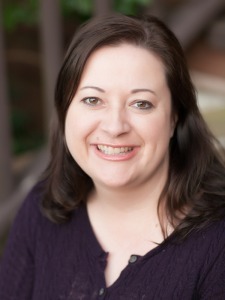 The giveaway fun continues with great pie prizes from OXO and Le Creuset! Scroll past the recipe for entry details. Preheat oven to 350°. Lightly grease a 10-inch pie plate. 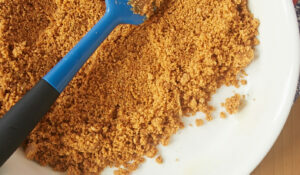 Place gingersnaps and pinch of salt in the bowl of a food processor. Pulse until finely ground. While the food processor is running, pour the melted butter through the food chute. Continue mixing until blended. Press mixture into the bottom and up the sides of the prepared pie plate. Bake 15 minutes. Then, place on a wire rack to cool. Whisk together sweetened condensed milk, Apple-Pear Butter, egg yolks, and apple cider vinegar until smooth. Pour into crust. Bake 15 minutes or until set. Place in refrigerator for at least 2 hours. Place cream in a large, cold mixing bowl. Using an electric mixer with a whisk attachment, beat at medium-high speed until the cream begins to thicken. Sprinkle sugar over the cream. Whisk until combined. Add vanilla and cinnamon. Continue beating until you can lift the whisk out of the whipped cream and a peak that curves downward forms in the cream. This should take 4 to 5 minutes. Spread whipped cream over the chilled pie. 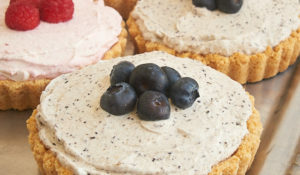 *Ideally, make the whipped cream as close to serving time as possible because the whipped cream will break down over time. If you need to make it in advance, it will still taste great. Recipe adapted from Southern Living. The Pie Week giveaways continue! OXO is giving one reader a set of pie tools including a pie server, a dough blender with blades, spice jar measuring spoons, a silicone pastry brush, and a stainless steel multi-purpose scraper and chopper. Le Creuset is giving three readers a pie plate and a pie bird. Please see the giveaway widget below for all the details and requirements for entering. If you are unable to see the widget, make sure your browser is updated or try viewing in another browser. The winner must be a U.S. resident 18 years or older. Disclosure: OXO and Le Creuset are providing the products for the giveaway. All opinions are my own. 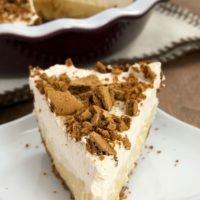 I have a weakness for gingersnap crust and this pie would be no different, it looks fabulous! I have been so curious as to what this pie was all about when I heard you were making it for Pie Week. It sounds right up my alley and SO unique and delicious. I adore gingersnaps and that apple-pear butter creamy filling sounds to die for. The cinnamon whipped cream just sends it over the top. Beautiful Jen! I am dying over this! That crust and the gingersnaps on top! Holy yum! 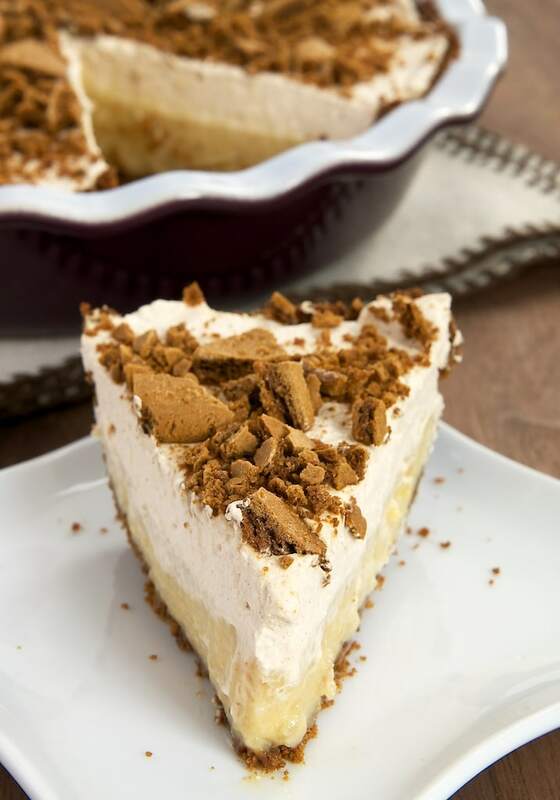 The flavor combination of this pie is amazing! I love pie, though I went with a cookie crust this year, pie dough doesn’t like me. What a great application for your apple pear butter! 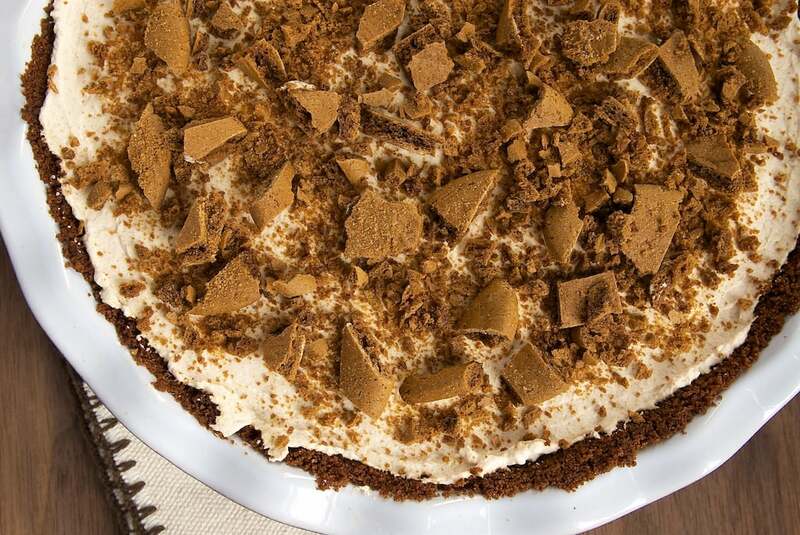 I also like the holiday twist with the gingersnap crust! Hi, PJ. There was an issue but it’s resolved now. Sorry for the inconvenience! I so rarely think of pear when it comes to desserts. Such shame I know especially when I could be having this! that looks absolutely divine! i could surely go for a slice right about now. 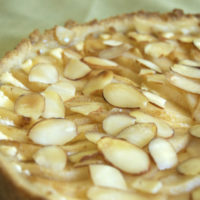 I absolutely love the simplicity of this pie, and it is seriously stunning! 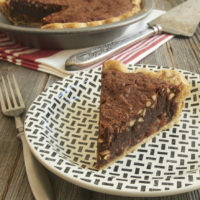 Would would have thought, apple butter in pie!? I need to give this a try! It’s true, you don’t see much of cold pies at this time of year…and why not? 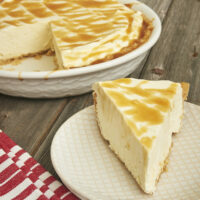 Just turn the heat up and hand over a slice of this, and I’d be quite happy. What a great looking pie! Yumm! Thanks for the giveaway! Yes, I see it now. I love apple pie best. I don’t mind a cold pie this time of year, especially if it is full of such great fall flavors. Gorgeous pie! You say that the pie should bake 15 minutes or until it has set. How will I know when it has set? Should it still jiggle a bit? Should it have any color on it? I’m pretty new to baking and could use any additional information! Thanks! Hi, Emily. The filling should be set, meaning that it doesn’t jiggle. Just finished making some apple-pear butter in the slow cooker. You gave me the inspiration though mine is a bit higher on apples since I didn’t gauge the count of pears in my head when I got to the store and undershot a bit. I can’t wait to use some of it to make this pie!! Thanks for 2 great ideas! Such a beautiful pie. I bet the crunch that comes from the gingersnaps is amazing! Sounds so wonderful and now I know what to do with all those assorted jars of ‘butters’ I have in my cupboards. 🙂 And, I’ve discovered that a tablespoon of instant vanilla pudding helps stabilize the whipped cream (w/o much flavor change). Much easier than the gelatin method. Also, if you beat it past the soft peak stage, it’ll keep from separating (if you like it more stiff). This pie is next! Thanks for the tips, Ellen!